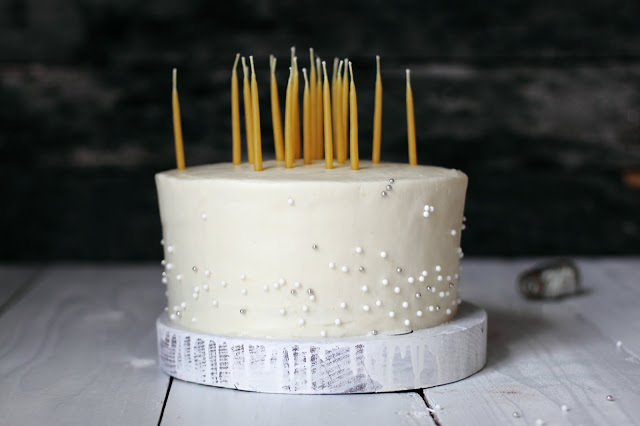 Coconut Cream Birthday Cake — always with butter. Coconut Cream Birthday Cake, for my Grandmother! She is a big coconut fan, I have never been so I wasn't too sure about this cake before making it. But she loves coconut, so I decided to go for it. It came out really well! The coconut is not overwhelming at all, most of the taste of it is in the filling. The coconut extract in the cake is just a hint of it. When you taste the cake by itself you can tell their is something special about the white cake, but the coconut is hard to distinguish at first. So throw all the filling, cake & frosting together and it works perfectly. Well, why would I doubt it? Its a Martha recipe. Unless you are making this cake for a party, or have a giant appetite, I would cut the recipe in half. It makes an extremely massive cake, hence the huge piece still left in my fridge after taking it to the party and dropping some off at relatives. I am getting a new camera! I am so excited, its a proper full frame camera. Agh! More about that later, I'm too excited to properly explain how this came about. And the weather has gotten terribly hot again, so all I want to do it go lay in front of my fan before I pass out. *the filling needs to set overnight! pans, bake for 40-45 minutes. Let cool completely. chill overnight. Beat until smooth right before using. Beat butter & cream cheese until smooth. Add in vanilla. Gradually add in sugar until desired thickness achieved.